Walruses are cumbersome and slow moving. But so is the animation process — a fact sure to be illustrated (ha ha) by Wallrus, a new art installation from the Seattle Experimental Animation Team that will occupy a section of the red construction wall surrounding the Broadway light rail station construction zone. 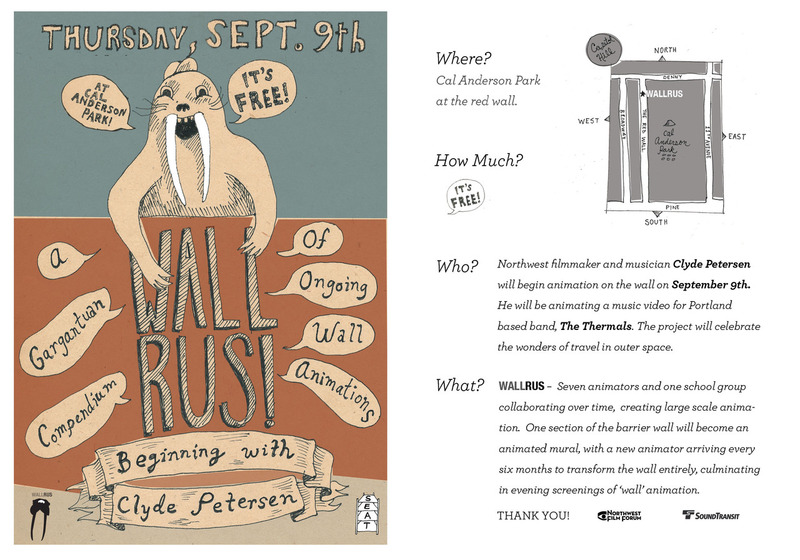 The installation’s first artist, Clyde Peterson, will begin painting the wall with blackboard paint for a chalkboard animation at 6 PM on Thursday, September 9th during this month’s Capitol Hill art walk. Here’s a look at a video Peterson directed for the band Thao with the Get Down Stay Down. His work from the wall mural will also be featured in a music video for the Portland-based band The Thermals. “Animation is the loneliest form of filmmaking,” said project spokesperson and animator Webster Crowell who is excited about the collaborative nature of the project. With the support of Sound Transit and the NW Film Forum, the installation will bring eight animators to a section of the wall near the 10th Avenue and Denny Way entrance of Cal Anderson Park where they will create eight unique animations frame by frame. Every six months, a new artist will be featured but all eight artists will work on each individual’s installation. Working in the open air with other animators will require each artist to work outside of their usual subject matter and style, organizers hope. Some of the artists work exclusively in drawn animation, others work with computers and some want to be a little more experimental. After each artist completes his or her animation, the final frame will be left on the wall until the next artist begins his own project. The artist could expand on what the previous artist left or repaint the wall and start over. Right now, Crowell and the other artists plan to take just a few days — starting during art walk each time — to complete the animations but he anticipates some artists like himself might choose to take longer. Crowell will be the final artist working on the installment and hopes to deconstruct the wall in some way as part of the animation but he isn’t sure how much damage Sound Transit will let him do to the plywood. “Fortunately, I have three and a half years to figure out what this actually looks like,” he said. The group hasn’t figured out a good way of projecting the animations onto the wall yet but hope to put the animations together into some kind of film at the end of the project. But Crowell said that could all very well change. The artists won’t really know what the project will look like until it is actually on the wall but that is part of the adventure. The project, according to Crowell, is nebulously tied to the idea of arrival because of its proximity to the future light rail station. “It’s something to do with the train showing up, but we didn’t say it was about the train showing up because we didn’t want everyone to animate trains,” he said. This entry was posted in Uncategorized and tagged light rail by Frances E. Dinger. Bookmark the permalink.